Colorado's North Front Range Metropolitan Planning Organization (NFRMPO) is a designated transportation and air quality planning organization. NFRMPO's objective is to provide long-range transportation planning, including information, tools, and public input, for improving the regional transportation system's performance. NFRMPO engages in cooperative decision making through working relationships and financial partnerships among the member governments, the Colorado Air Quality Control Commission, Colorado Transportation Commission, Federal Highway Administration, and Federal Transit Administration. NFRMPO comprises 13 member governments in Colorado (Berthoud, Evans, Fort Collins, Garden City, Greeley, Johnstown, Larimer County, LaSalle, Loveland, Milliken, Timnath, Weld County, and Windsor), covering 40 square miles and working on behalf of almost 360,000 northern Colorado residents. SmartTrips Web-based ride-sharing system allows users to instantly identify potential matches and view their proximity on a map. In 1993, NFRMPO created a program called SmartTrips to provide information about alternative and cost-saving transportation choices to the residents of northern Colorado, including carpooling, vanpooling, bicycling, walking, taking the bus, and teleworking. One of SmartTrips' premier services is an online carpool matching program. Carpooling allows the flexibility of driving alone on days when errands need to be run or someone needs to work late, while still providing the benefits of carpooling the other days. The program works by matching prospective riders from a database of more than 1,500 carpoolers who have similar destinations and schedules. Available through the SmartTrips Web site (www.smarttrips.org), the program offers commuters a cost-saving alternative to the daily commute and is available at no charge. Ecology and Environment, Inc. (E&E), an Esri Business Partner and a Lancaster, New York, firm, won a contract to update the SmartTrips electronic ride-share program in fall 2004. NFRMPO wanted a more interactive Web-based ride-share system with online map content that would allow users the ability to search for their own matches. Along with sister firm Walsh Environmental, E&E implemented Esri's ArcWeb Services Internet mapping technology into the ride-share application for ease of use by commuters. The updated SmartTrips program helps residents in three of the Colorado communities served by NFRMPOFort Collins, Greeley, and Lovelandtravel as often as possible without using a car. SmartTrips provides resources, information, and incentives to help users accomplish this goal, decreasing road stress, saving users money, and decreasing traffic for everyone in the area. The mission of the Web site is to provide information to help citizens choose smart transportation options. ArcWeb Services provide the updated maps and geocoding service for those looking to share rides. By using www.smarttrips.org and joining an online rewards club, MySmartTrips, users have online, instantaneous carpool matching, tracking of the money saved by not driving alone, a tally of the calories they've burned by walking or bicycling, and automatic e-mail notices of upcoming events. Users control the personal information that is shown to other carpoolers. Once a profile is created, possible carpoolers and their e-mail addresses are displayed and they can then be contacted by e-mail. The SmartTrips site also includes tools to help locate other transportation options, such as bus, vans, bike routes, and park-n-ride lots. SmartTrips is applicable to daily commuters, as well as to those who are making longer, less frequent trips, such as to vacation destinations. All of this is accomplished while maintaining a user's confidentiality. NFRMPO was pleased with the results of using ArcWeb Services, as it saw a 400 percent increase in SmartTrips' usage in the first quarter of 2005 compared to the same period the year before. "The North Front Range Metropolitan Planning Organization had a unique request to build a carpool matching service that needed to be very customer friendly," says Margie Joy of the organization. "It also needed to have administrative tools that could be accessed from multiple network systems. This system is just what our community needed." After successfully integrating GIS into SmartTrips, E&E saw more opportunities for ride-sharing applications beyond NFRMPO. The result was GreenRide (www.greenride.com), which helps reduce single-vehicle passenger trips by searching for carpool partners or other transportation methods that are convenient for users in meeting their commuting preferences. 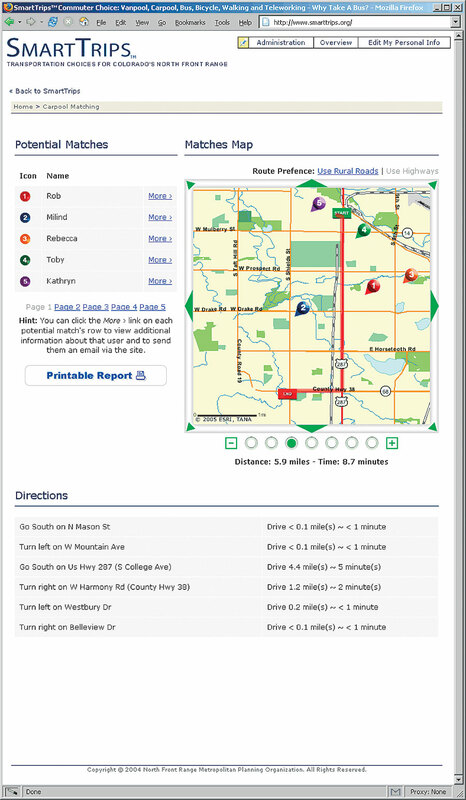 GreenRide also uses ArcWeb Services to geocode both the carpooler's home and destination locations. A sophisticated algorithm combines location coordinates with user preferences to produce potential carpooling matches. 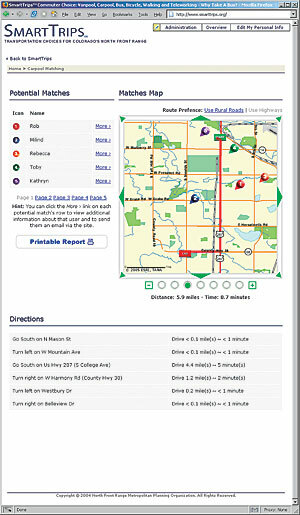 Interactive maps allow users to visualize their route options and create a scenario that fits their needs. For more information, contact John Daggett, Regional Multi-Modal Transportation Planning manager, Colorado North Front Range Metropolitan Planning Organization (e-mail: jdaggett@nfrmpo.org, tel. : 970-224-6190, Web: www.nfrmpo.org), or Tony Gale, Ecology and Environment, Inc. (e-mail: tgale@ene.com, tel. : 214-245-1000).